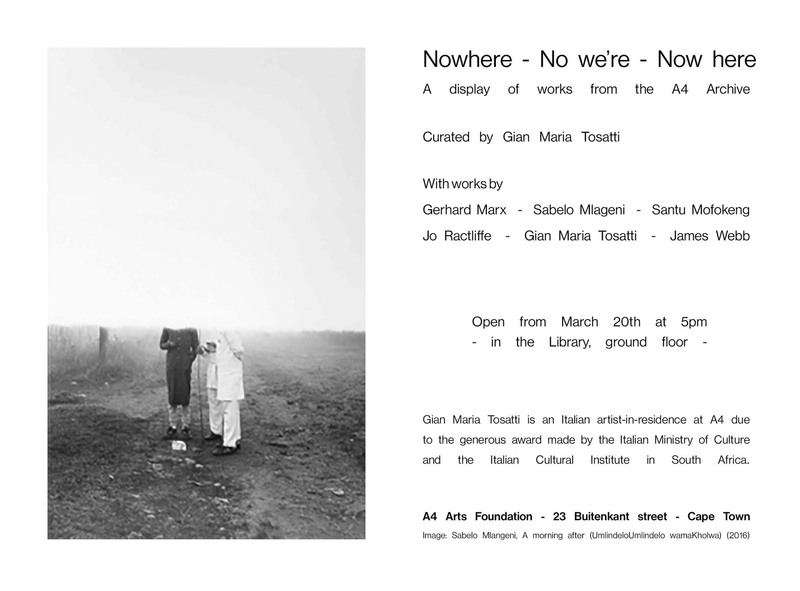 'Nowhere - No we're - Now here' is a selection of works from the A4 archive chosen by artist-in-residence Gian Maria Tosatti and shown in the A4 Library. Working between what is both a metaphysical and a tangible/real conception of the 'Void' he experiences at Cape Town's Central Station, Gian Maria Tosatti curates an intuitive selection of works from the A4 archive. Tosati's selection includes Gerhard Marx, Sabelo Mlangeni, Santu Mofokeng, Jo Ractliffe, the artist himself and James Webb. Tosatti (Roma, 1980) is an Italian artist whose research probes striations of identity, from the political to the spiritual. Gian Maria Tosatti is artist-in-residence at A4 due to the generous award made by the Italian Ministry of Culture and the Italian Cultural Institute in South Africa.